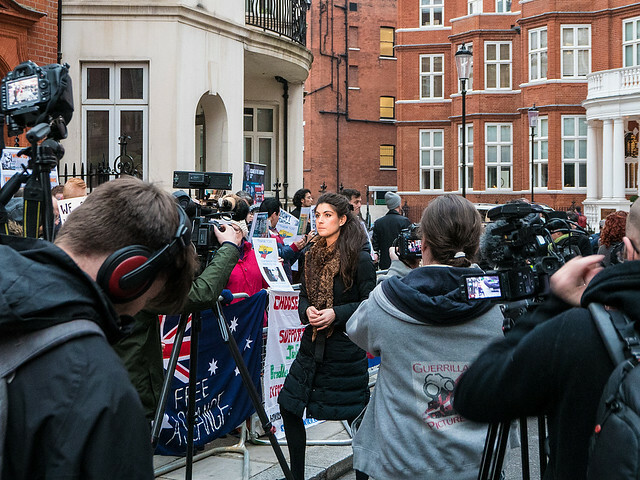 On Monday 16th of March 2015, whilst WikiLeaks Editor is detained for more than 1550 days by the Swedish authorities for an criminal investigation raised but not progressed by the Swedish Justice system, and under the watchful eye of the Metropolitan Police encircling the Embassy, we gathered to stand in support of Julian Assange, caught into a web of administrative injustice. A large collection of Somerset Bean Posters and an amazing 2 metre roller banner with the story so far, spread the message of solidarity at our vigil. 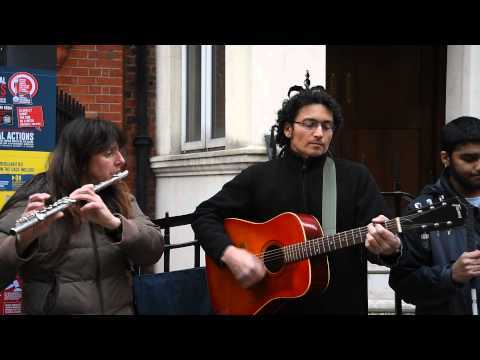 The sweet melodies of the guitar and the flute and the sombre but inspiring tunes of solidarity songs, accompanied us throughout our vigil marking 1000 days of Julian Assange under the protection of Ecuador in their London Embassy in Knightsbridge. We stood in solidarity, distributed flyers, chanted messages of support, shared cakes, spoke to representatives of the press and talked about the recent developments. Thank you for the Music Sue and Roland! The Friday before (13/03/2015), the most important news reached us. Since July 2014 through legal challenges initiated by Julian Assange’s lawyers to have the Swedish Arrest Warrant rescinded , first at a Swedish District Court, then onto the Swedish Court of Appeal in November 2014 and onto the Swedish Supreme Court in February 2015, finally, the Swedish Prosecutor Marianne Ny declared that at last Julian Assange will be questioned in London via Mutual Legal Assistance. In this respect it can be seen as a victory for the Assange legal defence team. ‘One of the tools in the Legal toolbox‘ as described by French Jurist and EU Parliament member Eva Joly, MLA is going to be used by the Swedish Prosecution service to progress the case. Or is it? In the last four and a half years we have seen Julian Assange been dragged through the mire. The notoriously unjust European Arrest Warrant mechanism led to an Extradition Process that lasted two years, during which JA had to endure arrest, imprisonment, house arrest, having to spend his time and resources to fight for his freedom through the courts, having his name smeared by an unforgiving UK press. Finally, for the last two and a half years, the Ecuadorian Embassy became his refuge, his life and work protected. The Swedish Prosecution service has proved to anyone who cares to read the facts, that process not justice is what matters, even if it leads to the longest pre-trial detainment in the Swedish history. The UN Working Group for Arbitrary Detention is currently examining the urgent submission for relief on behalf of Julian Assange regarding his detention. The prevarication of the Prosecutor has been such that their latest move could easily be interpreted as an effort to sideline the efforts to have the Swedish Arrest Warrant rescinded, not only unlocking the deadlock by forcing the use of MLA by removing JA’s detention order but actually having the case dropped altogether. Moving the goalpost is one of the finest privileges of exercising power. Could the Swedish Supreme Court process have forced the prosecutor to admit the lack of evidence in the case or to finally share exonerating evidence with Assange’s legal defence team? Fair trials international submitted their legal opinion as part of the Supreme Court legal submission in which this particular issue is highlighted. Was Assange’s legal team as close to throwing the case out as that? Such questions may not have been asked by journalists present at the vigil, but I was given the opportunity to explain to a wider audience why we had gathered in support. This is the clip that went out on that night on London Live TV with Alison Earle, who was so gracious as to pass me a copy for which I am very grateful. As WikiLeaks supporters we may not have the privilege, knowledge or clarity of vision or understanding to provide the answers. But whilst the grey cells do plenty of stretching exercises, and learn about the world as a result, we can vote with our feet, in a simple act of solidarity, standing in support. In support of those who reveal the master narrative of ‘how to justify a war’ selling it to the media, those who expose how modern warfare is conducted how diplomacy for the powerful states is a facade for guiding or twisting the hand of friends and foes or how technology allows repressive states to control through surveillance those who oppose it. And by supporting WikiLeaks and its work in delivering to the public these truths about how the world works, we show our support to all those whistleblowers around the world who take a risk and often sacrifice so much of their personal happiness and wellbeing for the good of the many, in universal solidarity. Queer Strike and Payday Network supported the Solidarity Vigil with some amazing chanting! In Solidarity, Free Julian Assange, Chelsea Manning, Jeremy Hammond,Barret Brown, Justice for Snowden! 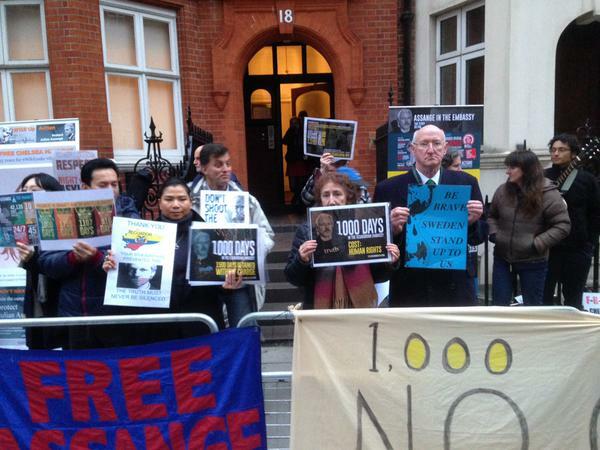 Gallery | This entry was posted in Assange, Manning, Press Freedom, Snowden, WikiLeaks and tagged 1000 Assange days at the Ecuadorian Embassy, Ecuador, Ecuadorian Embassy, Julian Assange, Knightsbridge, London 16th March 2015, press freedom, Solidarity Vigil, WikiLeaks. Bookmark the permalink.